When Lady Bon-bon was born, Addie Blue was concerned about giving up her "little sister" title. She didn't like the idea of being called "middle sister". So we all agreed she would stay Little Sister and Lady Bon-bon would be Tiny Sister. 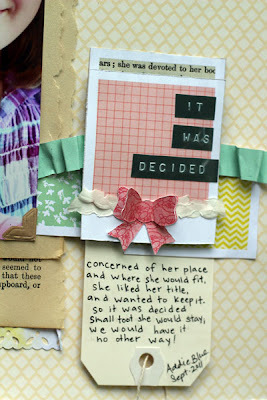 Used lots of new Dear Lizzy on this one, along with a piece of Peachy Keen patterned paper for the background. I covered a tag with confetti and sequins, and adhered a jar cut from a 6*6 pad of Dear Lizzy paper. the bows and hearts are punched from 6*6 papers, too. Love these small size papers! 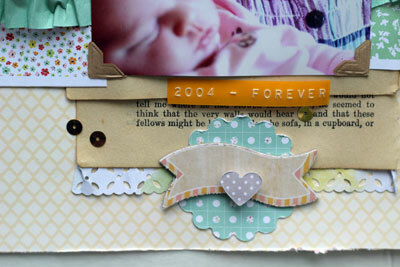 I layered several of these cute pattern-filled polaroids to create a chunky border behind the title block. 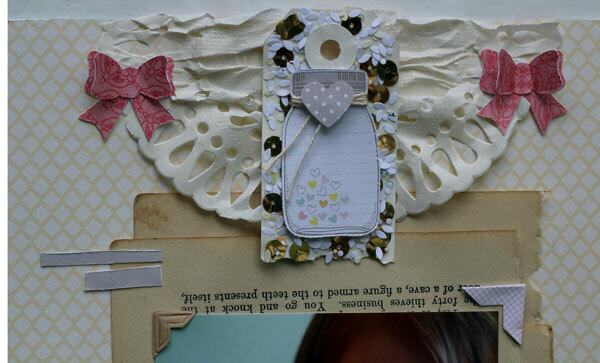 The banner is from the Dear Lizzy chipboard set. I used some gold sequins from Dear Lizzy trim to sprinkle around the page, too. The punched lace paper beneath the old book page is a cut-off strip from Dear Lizzy paper. Supplies: patterned paper (American Crafts); chipboard (American Crafts); punches (Martha Stewart, Fiskars, Recollections, McGill); sequins (American Crafts); tags (the Paper Company); photo corners (Canson); pen (Sakura). what a wonderful win-win solution to Addie Blue's dilemma. 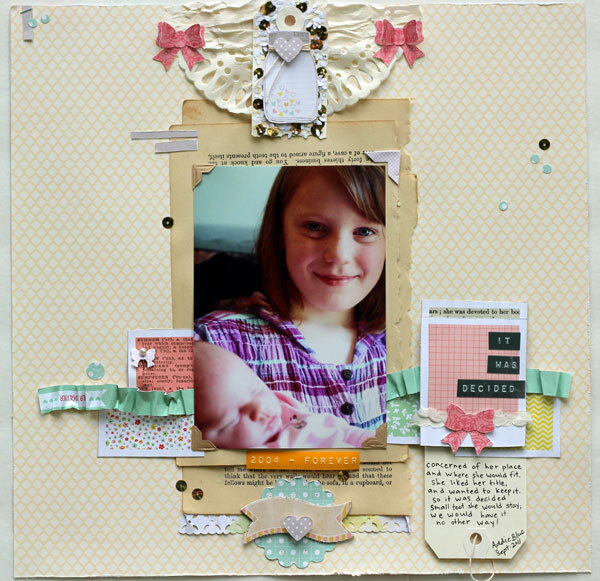 Another great page with lots of layering!